Nestled in the pastoral landscape of the Blue Lake Estates’ Community, a group of cautiously optimistic operators, officials and suppliers gathered around the Deer Haven lift station. The big question about to be answered for Llano County Municipal Utility District (MUD #1), was whether their investment in a new pump would pay off. 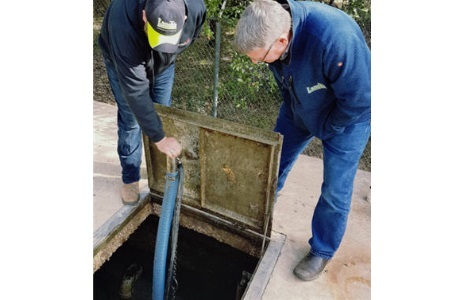 Even with just 480 residential connections at one of Lake Lyndon B. Johnson’s (Lake LBJ) most coveted neighborhoods, Llano County MUD #1 was becoming weighed down with ongoing lift station maintenance issues and increasing odor concerns. The culprit was an extremely thick, impenetrable scum and FOG layer, which had made it difficult to retrieve the existing duty pumps for service. While maintenance personnel were having to regularly engage the problematic scum layer at the main Deer Haven lift station, things really came to a head at the district’s second, smaller, Sandy Harbor lift station. Float switches caught up in the scum blanket caused a duplex pump station to allow both duty pumps to run dry. The ultimate sacrifice of these duty pumps meant $15,000 in replacement costs. Llano County MUD #1 decided that it was time for a more pro-active approach. “To keep things moving and try to prevent overflows and reduce odors, we were having to constantly hose down the lift stations to try and break the scum layer”, said Operations Manager Tim Webb, “but in about 30 minutes, the scum layer was soon back. Untangling the floats had become routine. The whole thing was an unpleasant, tricky job having to reach out and inevitably get covered in sludge. Simply trying to get to the duty pumps, was difficult”. He added: “We’re on a pressure system here. There’s no gravity feed. Everything gets emulsified in the grinder pumps that have been issued to local residents, but the plastics float, rather than sink. The whole time our float system was being affected by the build-up of the sludge blanket. Our existing pumps would get air-locked. It reached the point where we were having to spray under the pumps as we were lowering them and tilting them to release air. This was a challenge we could have done without. Despite our constant efforts, we were fighting a losing battle, ultimately resulting in not being able to get to the pumps through such a thick blanket of scum”. Tim also noted that there is always the issue of plastics, sanitary products – and occasional, seemingly indestructible mop heads – plus other unwanted surprises that make it into the sanitary sewer system – now a very typical scenario at many municipal lift stations all over the nation. Llano County MUD #1 called upon Texas water and wastewater pump specialists, Smith Pump Company, who supply many of the grinder pumps to homes in the area. Customer Relations Manager, Darrel Mize suggested the Landia AeriGator – a chopper pump with an external knife cutting system and a venturi nozzle that injects air into scum blankets. The combination of chopping and injecting air successfully chews up the rags and breaks down the mass of solids that causes the many unwelcome labor hours spent these days at lift stations. “We tried to resolve the lift station issues, but the band-aid approach wasn’t for us. The loss of our pump at Sandy Harbor wasn’t something of course that we wanted to repeat. Darrel at Smith Pump told us about how the Landia Chopper Pump would be the most cost-effective and efficient purchase we could make for the long term – but it’s fair to say that because the blanket of scum was so thick, we were all a little apprehensive when we switched the Landia pump on for the first time. We thought it could break everything up to an extent, but it mixed everything, right into the corners of the Deer Haven lift station, which was all the more impressive because of it being a harder to mix, rectangular (12’ by 12’) tank. In just 30 minutes, we could see a big difference”. Initially, the Landia AeriGator was run 24-hours per day until the lift station reached a point where there were no scum/plastics/solids on the surface. Once these layers of scum and trash were gone, the pump was adjusted to run for just 15 minutes each morning. With this new arrangement, the Aerigator now prevents new scum layers from forming, This protects the existing duty pumps from any possible heavy ragging and allows them to do their basic job properly. Following the success of the 6.5HP Landia AeriGator at the Deer Haven lift station, Llano County MUD #1 introduced a 6.5HP Landia Eradigator chopper pump for the slightly smaller diameter Sandy Harbor lift station, where the $15,000 pump failure had occurred. Unlike the AeriGator, this chopper pump is not fitted with a venturi nozzle because scum is not the primary problem there. The EradiGator has a recirculation nozzle that keeps the lift station well mixed, while macerating any rags that could clog the duty pumps. Flow from the Sandy Harbor lift station goes to the Deer Haven lift station – and the combined raw wastewater is then pumped to the City of Horseshoe Bay WWTP. “It may seem a small point, but we can now save $600 annually on the water hose connection that we had to have available for wash-downs at Deer Haven. For locations with no readily available water supply, the installation of the Landia pumps would make a big difference. The AeriGator can often eliminate the scum layers that form in a lift station or wet well to the point where wash-down water is no longer needed to break up even the thinnest of scum layers”. He concluded: “Since we started using the Landia pumps, the waste build-up is no longer sitting in the lift stations, so we have a much fresher product with greatly reduced odors. “The amount of time we spend on call-outs to prevent the lift stations from overflowing is now a thing of the past. Because of the new pumps, we’re back to where we should be – basic preventative maintenance. And we always know that we can depend on Smith Pump Company and Landia for any assistance, which is great peace of mind”.